Lonicera japonica, Hall’s honeysuckle, is an iconic landscape plant that is seen in many landscape settings from cottage to zen style gardens. This vigorous vine is typically used to grow on fences, trellises, or buildings; honeysuckle can also be used as a groundcover. The flowers emerge in spring and continue until first frost. Pollinators flock this this showy tubular two-lipped flower that opens up white and ages to a beautiful light yellow. Fragrant flowers form in clusters along the stems and are followed by dark berries in the fall. This vine also has attractive deep green oval foliage that is 1- to 3-inches in length and is either evergreen in warmer zones or can be semi-evergreen or deciduous in colder zones. 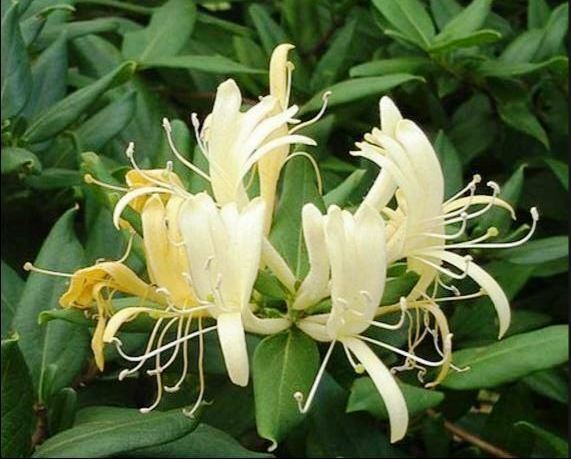 Hall’s honeysuckle is very drought tolerant once established and can tolerate a variety of soil conditions. This vine thrives best in full sun, but can also be grown in more shade though it will flower a bit less. Honeysuckle is very pest and disease tolerant. However, it can become a pest itself if not properly maintained or if it is planted in the wrong spot. Seasonal pruning and giving it plenty of room, will make a beautiful addition to any garden.